A lot has been written about retirees who choose to spend their golden years as fulltime RVers. And with good reason – there are many such people traversing the highways and byways of North America. But what about younger men of pre-retirement age, with their wives – and even children – who take to the road in conjunction with their jobs? Many occupations require people to be away from home for extended periods of time, and an RV can be preferable to a motel room. Not much has been written about these modern nomads, yet they do exist. It is surprising how many young couples and families are living this lifestyle. Some are involved in construction – from grocery stores in North Carolina to pipelines in Manitoba, Canada. Others install communications equipment or do electrical work on a contract basis. One young father traveles with his wife and two sons, supervising the clean-up of hazardous wastes. There is the traveling anesthesiologist and his wife, from North Carolina. The pipefitter and his wife and daughter, from Ontario, Canada. One memorable RV family is the teacher with his wife and six children, who were touring North America in a motorhome and educating their own children, all as part of a book he was writing! Most of these people cite family togetherness as one of the main reasons for RVing as a family. Motels often come out second best because they are more expensive, may not be clean or quiet, necessitate constant packing and unpacking, and they just aren’t home. Eating out is expensive – and tiresome – on a long term basis. And several families pointed out that campgrounds provide a safe and enjoyable environment for children. Finally, there is the opportunity to purchase an RV as opposed to simply paying rent on a motel room. Fulltime RVing has a lot to offer a family with a desire for adventure. There is the anticipation of wondering where the next assignment will be – perhaps a new state, a different climate, even a different culture or nationality. Wherever it is, there is bound to be new things to do and see, new people to meet, a learning opportunity. What better way for children to grow up than to be exposed to such a variety of life experiences? Children playing happily with black children in a laundromat in North Carolina, or struggling to pronounce ‘bonjour’ in a French-speaking area of Canada, or examining the native symbols carved on a kitchen table on an Indian reservation, provides experiences that will help counteract any racial attitudes they may encounter in the future. Each new area possesses something that makes it unique, and FOTR families make it a point to visit the area attractions, climb mountains, swim in the lakes, observe the wildlife, and sample the local cuisine. Mementos are collected, but best of all are the memories of the places, and the friends made along the way. Some people say this lifestyle is like a paid vacation. Although families disagree with that interpretation, there are certain aspects of this live that resemble a vacation. Such as living in a campground with an abundance of recreational possibilities, and traveling to various parts of the country (and sometimes many do manage to visit popular tourist attractions at just the right time of year.) But the real fun is getting to know and understand the area and its people, and how they live and think. It makes for a broadening of one’s view of the world. Perhaps you are in a job situation that has you contemplating such a lifestyle. Although fulltime RVing has many pluses, there are some unique concerns that must be addressed. There is a financial responsibly to make the trailer payments. Are you subject to layoffs and slow spells? Could you wind up in a cold climate or in an area where there is no campground? If so, could you afford to pay for an RV that you are not using? If you move very often, you may have to pay daily rates rather than weekly or monthly rates, which are much cheaper. And if your job takes you downtown in a major city, you may have a very long commute from the nearest campground. Even if your RV is insulated for winter, many campgrounds close in the fall in northern climates. This can be a problem for the RV family who is subject to the demands of the job regardless of season or location. Families who have spent winters in the northern US and Canada, can say that, while this does pose a challenge, there is no need to throw in the towel immediately and head for the nearest motel. Many call all of the campgrounds in the area of work, even if they are officially closed, explain the situation, and ask if they can accommodate them or suggest other alternatives. Last winter, one family spent six weeks at a campground in northern Ontario with full hook-ups, even in minus 40 degree weather! Even more surprising, there were five or six other couples and families living there in their RVs as well. The next step is to call all the mobile home parks. Some of them allow RVs, and they usually charge less. However, it is wise to check these places out first, as some leave a lot to be desired. That being said, you can still find very satisfactory accommodations at some mobile home parks. There is also the possibility of boredom and isolation, particularly for the wife and children. Most RV wives are quite self-reliant. But anyone can get lonely or bored, especially in the winter, when there may be an absence of other young families at some campgrounds. 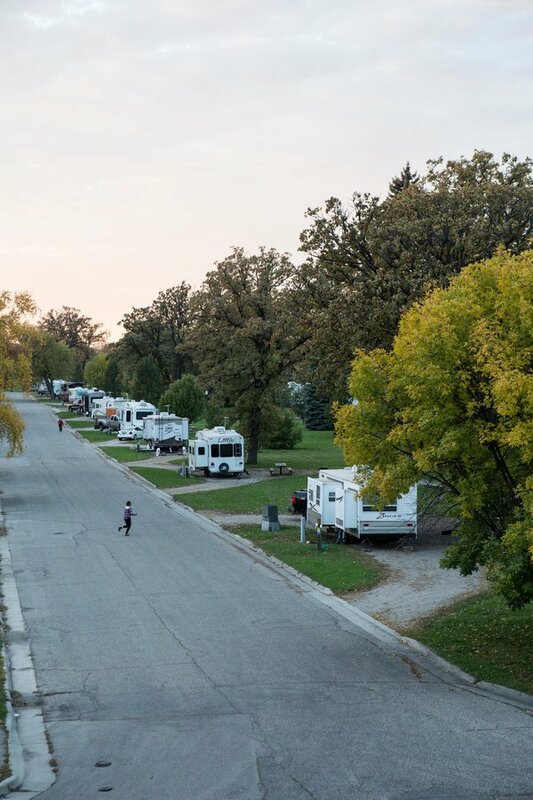 Many families combat the isolation by chatting with RV neighbors, having people over, going to campground or community events, visiting libraries and shopping malls, and communicating online. Belonging to a church or other group helps immensely, as you can get together with people of like interest, wherever you may be. It is difficult for an RV wife to have a job, unless the family is going to be in an area for some time, or she has her own ‘RV business’. Some women with one or more children, dedicate themselves to their homes and families. Others enjoy crafts, volunteering, reading, exercising, and other pursuits. A limited living space can be frustrating at times, especially if you are used to a large home. Couples and smaller families seem to find it easier, but larger families cope just as well. Of course, a large trailer makes things easier, and a two-bedroom unit is a definite plus. Don’t take more belongings than you have room for, and insist on orderliness. Make it a point to get out often – taking advantage of good weather to enjoy outdoor pursuits. And finally, the question of schooling. It seems that everyone will ask if you plan to settle down. Many families choose home schooling over a more standard education. In many situations, families often move on a weekly or monthly basis, making regular schooling a non option. Other families move less frequently and put their children in school, transferring them as necessary. Both options are viable solutions. It is an issue that each family must decide for themselves, after carefully evaluating their particular situation. If, after examining your own situation, you decide that fulltiming could work for your family, here are some final points to consider. Don’t underestimate the cost of fulltime RVing. In addition to monthly trailer payments (which can be substantial, especially for a larger RV), calculate the cost of lot rental, insurance, licensing and registration, LP gas (for heating and cooking), extra fuel to tow your RV, and maintenance of your RV and tow vehicle. How much you can afford to spend, after all the other costs are determined, will largely determine what type of RV you buy. Many fulltimers live in larger RVs with options like slide-outs and washers and dryers, but other manage quite well in smaller models with no extras. Fifth wheels and travel trailers, which can be unhooked from the tow vehicle, are a favorite among fulltimers. But if you are on the move a lot, especially with children, a motorhome may serve your needs better. Also consider your commitment to your job. If you are unsure or thinking short term, maybe you should keep your investment to a minimum. Renting or borrowing an RV to see how it goes is an option. Most of the fulltime RV families we’ve met maintain a permanent home somewhere, even if they only visit it occasionally. There are advantages to this setup up, but it does cost more. Again, it depends on what you need and can afford, and your job situation. If you do decide to take to the road as a family, you are in for an interesting life. 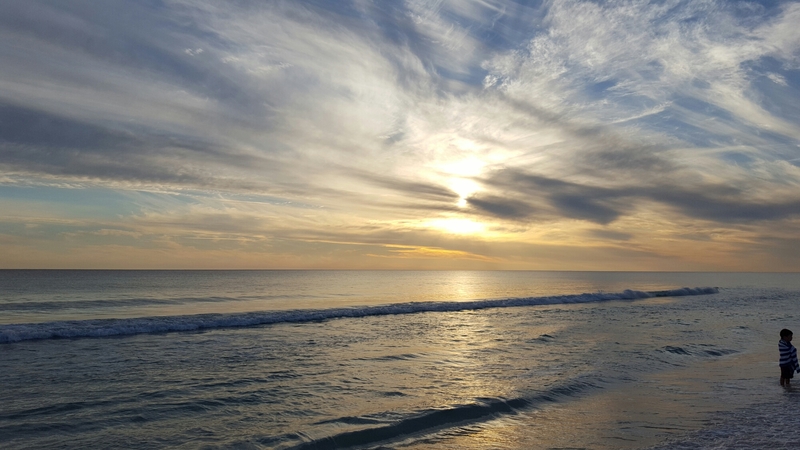 Traveling to various places throughout the U.S., meeting people from many walks of life, enjoying life together as a family in vacation-like settings, are all part of the fulltime RV lifestyle. ← What Is The Best Truck To Pull A Fifth Wheel RV?